The Milky Way shines above the HI-SEAS habitat in Hawaii. On June 13, for the first time in eight months, Jocelyn Dunn stepped out of a Mars-like habitat in Hawaii without a spacesuit. Dunn, an industrial engineering student at Purdue University, and five other crewmembers had just finished simulating a Mars mission at the Hawaii Space Exploration Analog and Simulation (HI-SEAS) facility, performing science experiments and geology work similar to what a real crew on the Red Planet would do. Although there was no gravity adjustment at the end of the mission, the crew certainly had to adapt to life back on "Earth," she told Space.com. "And trying all the new foods — not new foods, but uniting with the foods from Earth — and lately, I realized my senses were still dull," she added. "Inside a small, confined space, you always know what's going on. You don't need heightened awareness." Martha Lenio collects lava rocks for an indoor gardening research project that harvested the crew's only source of fresh foods. Since the end of the mission, Dunn has been busy analyzing data gathered from her crewmates over those eight months. Traditionally, studies in confined environments have included surveys to see how people are feeling; Dunn tried to supplement those observations by giving crewmembers Jawbone activity-tracker wristbands to get real-time measurements of how their bodies reacted to the Mars-like environment. 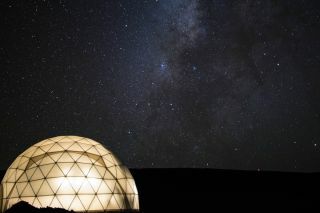 The facility is located on a dormant volcano, Mauna Kea, which could be considered an analogue for Mars because there are also volcanic plains on the Red Planet. The area is also isolated, requiring crewmembers to rely on their own resources except in dire emergencies. The results of the mission will form part of Dunn's Ph.D. dissertation in industrial engineering at Purdue University, where she hopes to graduate in about a year. Each of the other crewmembers had science to contribute as well. Cmdr. Martha Lenio oversaw the herb garden, which produced enough lettuce for crewmembers to eat a salad at least once a month. (The rest of the time, they ate dehydrated food.) Executive Officer Sophie Mylum did educational outreach with a 20-minute time delay to Nevada school students on projects such as robotics and water filtration, both of which will be needed on future Mars missions. Jocelyn Dunn, who played golf for Embry-Riddle Aeronautical University, fires the “first golf shot on Mars”. This included testing 3-D printed golf balls designed and printed by Zak Wilson. In 1970, NASA Apollo 14 astronaut Al Shepard played a few golf balls on the moon. Crew engineer Allen Mirkadyrov ran orbital dynamics scenarios — efficient paths for sending spacecraft through the solar system— to get spacecraft to Mars, while chief engineer Zak Wilson busily 3D-printed replacement parts for the mission. Neil Scheibelhut, the medical officer, looked at how bacteria in the gut changed as the crew ate rehydrated food, month after month. "You have to make sure it's fully rehydrated [when you eat], or you get some digestive issues," Dunn said. This would be applicable to Mars exploration because crewmembers would likely be eating food of this sort. Relations among crewmembers remained cordial throughout the mission, although there was the occasional dispute, she noted. The crew countered those arguments by doing team-building exercises such as yoga; celebrating holidays such as Halloween, complete with prepackaged costumes; and having a weekly discussion about ongoing issues and working to resolve them. The crew kept communications with "Earth" to a 20-minute time delay, simulating what would happen during a real Mars mission. And, if something broke, unless they were in dire danger, they worked to fix it with support from a ground team. One moment in the mission could have been out of Andy Weir's novel "The Martian": Three separate power systems for the habitat failed. And because it had been cloudy, the solar array didn't have much power to spare. Then, a hydrogen-powered system ran low. Finally, the gas generator — the ultimate backup — refused to charge the batteries needed to produce power. "We had to disconnect part of the energy system," Dunn said. "It was all very like Mars, except were weren't [experiencing an] actually-going-to-die kind of emergency situation. It was challenging, but also fun to have to troubleshoot together." With $1.2 million in NASA funding, HI-SEAS has hosted four- and eight-month-long simulated missions over the past two years. A one-year mission will be next, starting Aug. 28; the six scientist crewmembers for that mission were announced Aug. 3. Editor's note: This story was updated on Friday, Aug. 7 to correct the start date of the next HI-SEAS mock Mars mission. It begins on Aug. 28.